Mold removal requires certified, experienced professionals in order to identify all existing mold and remove it safely and completely. Mold damage in a home can be especially difficult to remove permanently. Without a trained and fully certified technician performing the work, the mold may not be completely removed, or it may simply grow back in a few months. Mold damages personal property and also can seriously affect the health of many residents within a household -- especially those with asthma or allergies. A single square inch of drywall can contain between one and 10 million mold spores. It only takes three to five of those spores to cause a reaction in a sensitive individual. Keith Trembley Home Solutions is your local professional source for mold removal. We can handle all your mold remediation needs, no matter how sever the problem. Call us today to get an estimate in Brewer, Bangor, Augusta and the surrounding areas. Mold grows quickly: Mold needs only moisture, temperatures above 40 °F (4 °C), and organic material to survive. Mold can grow in 24-48 hours, preferring areas with no sunlight, limited airflow, and little disruption. 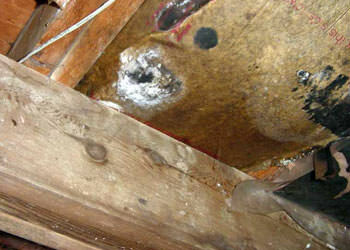 Mold destroys your home: Mold issues can dramatically lower the value of your home. A home with significant mold problems will be difficult to sell at any price. Additionally, mold can lead to serious structural damage to your home. Cleaning visible mold is not enough: Mold can grow in fiberglass insulation, on top of ceiling tiles, inside ducts, behind drywall panels, in wall cavities, and behind wallpaper. Even when it's visible, it's often impossible (even for an expert) to tell the difference between mold, soot, and dirt without testing. The mold you can see is just the beginning, and some of it is extremely hard to find! Bleach & detergent will not eliminate mold: Bleach and detergent are useful for removing mold on nonporous surfaces. However, materials such as ceiling tiles, carpeting, and wallboard will have deep mold penetration and may need to be replaced. Removed mold will regrow unless all sources of moisture and humidity are eliminated. Mold cleaning is hazardous: It only takes 3-5 mold spores to cause an allergic reaction, and some molds contain mycotoxins that are carcinogenic or deadly. Vibrations and movement will cause mold to release their spores; it's easy to accidentally knock hundreds of thousands of spores loose from a single patch of mold! And that's just a drop in the bucket: Recent research has shown that up to one billion mold spores can be found in just one square foot of drywall! Mold removal requires professional equipment and training: Mold removal experts have a variety of state-of-the-art equipment that they use to identify sources of moisture, dry out wall cavities, and safely remove mold that is growing in your home. Samples of mold may be analyzed in a laboratory to identify potentially toxic strains, and special cleaning agents may be used to restore property. At Keith Trembley Home Solutions, we offer certified, professional mold removal in the Maine area, including Augusta, Brewer, Bangor and surrounding areas such as Ellsworth, Skowhegan, Old Town, Bernard, Orono, Penobscot, Birch Harbor. If your home currently has mold or is at risk of developing it, we can help make your house dry, clean, and safe. We pride ourselves on our dedication to customer education, service, and our adherence to available national standards and best practices in indoor humidity control and mold removal. Our experts are standing by to help you! If you've experienced mold issues, our team can get your home back to normal fast. To learn more about the cost of mold removal or remediation, call us at 1-844-913-7481 to request an estimate today!